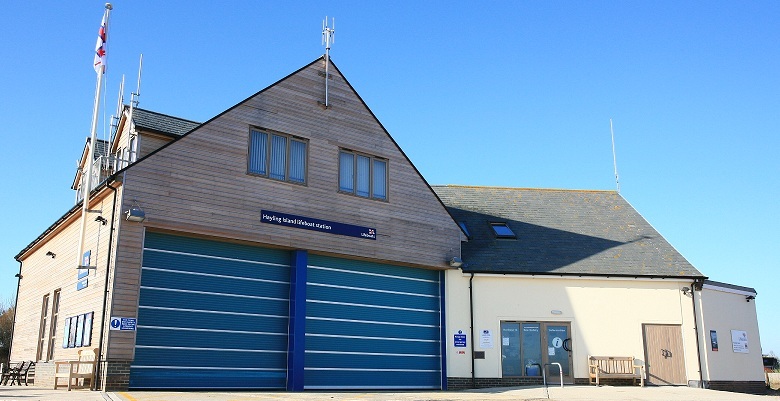 Hayling Island Lifeboat Station was originally established in 1865, closed in 1924, re-opened in 1974, rebuilt in 1995 and extended in 2007. Our boat hall is 19m by 11m. Having a boat hall of this size allows us to keep the boats close connected to their tractors. If we have to do a net recovery, the size of our boat hall also allows us to turn the boat round inside the boat hall (see Launching and recovery for more information on net recovery). In the old station none of this was possible. The crew changing room is situated in the boat hall of the old station giving a room size of 11m by 7m, in the changing room we have a shower, male toilet, female/disabled toilet and a dry store for repairing dry suits. Our training room is situated above the crew changing room, this is where we hold our training meetings, crew meetings and AGM’s. We also have the ability to show RNLI training and promotional films and presentations to visitors. We have seating for 50-60 people, a computer is connected to a smart board, projector, sound system and various training aids. These training resources have all been funded and donated by local businesses. The crew room which is located above the boat hall. It has an operational area, a galley and an area set aside for the crews to relax in. The galley has a fridge, dishwasher, microwave and cupboard storage. In the operations part of the room we have, a fixed VHF radio, a VHF Radio Direction Finder (RDF), a Navtex for weather reports, a chart table with all accessories and chimet which provides up to the minute information at the harbour entrance. For more information on the equipment we have in the station please click here.